F. Scott Fitzgerald's The Love of the Last Tycoon gets a new adaptation. Lovelier the second time around? I read The Love of the Last Tycoon so long ago, it was still known simply as The Last Tycoon. * Now, the famously 'unfinished' F. Scott Fitzgerald novel is headed to Amazon in series form. Billy Ray (Hunger Games and Captain Phillips) is writing the screenplay inspired in part by the rivalry of Hollywood heavyweight Louis B Mayer and his head of production at MGM, Irving Thalberg, Pat Brady and the novel's main character, Monroe Stahr respectively, in the novel. Apparently Mayer had a habit of claiming some of Thalberg's innovations as his own but it's broadly acknowledged that it was Thalberg who really created the studio system. The Love of the Last Tycoon, informed by F. Scott's own troubled experiences working within that same system, is as much an indictment of that system as it is the tale of a man, torn apart by the loss of his wife, struggling to move forwardm burying himself in his work. A movie about making movies; just my cup of tea. 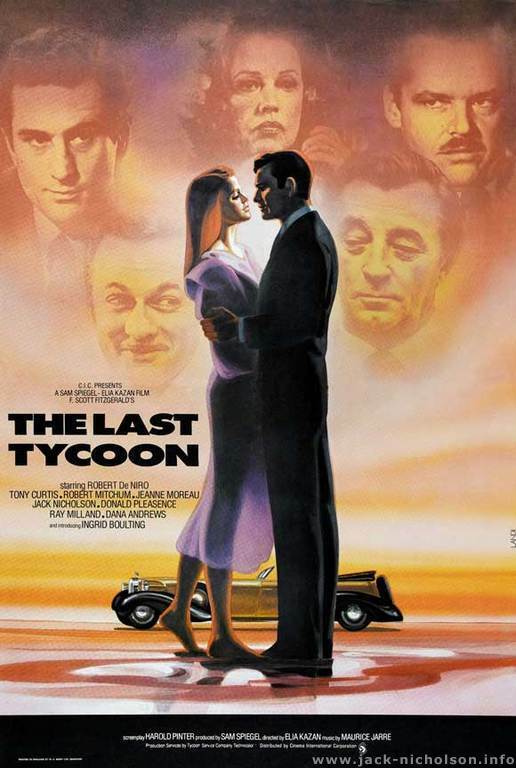 What I'm confounded by is that I don't remember the first movie, released as The Last Tycoon in 1976 at all. How flawed a film must it be that with the legendary Elia Kazan directing a star-studded cast including Robert DeNiro as Stahr, Robert Mitchum, Tony Curtis, Jack Nicholson Jean Morreau and Donald Pleasance, that it's been relegated to the forgotten file? I may have to add The Last Tycoon to the list of films I want to stream on Amazon to see if it rings any old bells. * Matthew Bruccoli, noted F. Scott Fitzgerald scholar, retitled the book, according to Fitzgerald's intention, when he put together his new annotated edition in 1994.